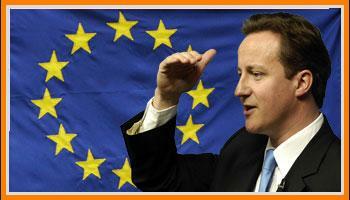 Cameron rules out pact with UKIP that wasn't even on offer! A deluded David Cameron has told the BBC that he wouldn't enter into the pact with UKIP that UKIP doesn't want but his members keep asking for. Cameron thinks that his Cast Iron Guarantee™ of an in-in-in for another 2 years of negotiations before we're allowed to get out referendum on "Europe" (he means the EU but he doesn't know the difference) if they win the next election is enough to win over enough voters to give him a win in 2015. He also thinks their completely inadequate controls on immigration - to limit the number of our friends from the Commonwealth and the rest of the world who can come to live and work here whilst allowing unlimited immigration from every country in the EU - is enough to meet the demands of a public that is growing increasingly angry at the insanity of flooding the country with immigrants that we don't need and can't afford. The man is on another planet. Hopefully the other inhabitants of Planet Cameron aren't allowed to vote here because the thought of another 5 years with the deranged Tories and Limp Dems in charge is equally is frightening as 5 years of Labour. We don't need Cameron to dismiss the idea of an electoral pact between UKIP and the Tories because it's not on the cards. It's Conservative Party candidates and members that keep talking about a pact because they're desperate to save their own skins, UKIP members haven't asked for a pact and the vast majority wouldn't entertain the idea of joining forces with the toxic Tories. Nigel Farage told the Tories in May last year that there was no chance we would be joining forces with the Tories and in May this year I pointed out (following more talk of a pact from the desperate Tories) that we are not here to make the Tories electable. The UK has been a member of the EU for over 40 years, it has leached into our institutions, traditions, law and lives. It would be foolish to think that it could be removed, that we could leave, and everything would carry on as if we had never been members. On Friday, a very ominous media development took place that could profoundly affect UKIP's destiny. No, I am not talking about Godfrey Bloom, but rather that the High Tory grandee Charles Moore used his column in the Daily Telegraph to advocate reorganising Tory party organisation on social media lines. Douglas Carswell's ideas are finally gaining traction. This followed Tory Party chairman Grant Shapps' move to finally publicise membership figures and in particularly those of individual associations, in order to incentivise them to experiment in new ways to attract members. This is potentially disastrous news for UKIP. Yes, the Tory party has many deep seated structural and cultural weaknesses which will make this a difficult road to travel: it has an arrogant, snobbish leadership and a culture of centralised cliquish control. It is not trusted by great swathes of the electorate and has manage to seriously alienate vast numbers of it's natural supporters. However, it still retains vastly greater financial resources and more, if deeply demoralised, members than UKIP does. Indeed, the Tory party has absolutely no choice but to go down this road. Now with a considerably smaller number of members than the Labour party, the distribution of it's vote means it has nonetheless considerably more marginal seats to defend. Furthermore, the ruling out of a pact with UKIP by Nigel Farage means it will face highly committed and enthusiastic UKIP activists across the country. Many of these will be ex-Tory activists who know their territory and who are thirsting for revenge on their former party. Without a rapid increase in membership, the party's re-election efforts look doomed. Of course our voting demographic includes a great number of people who would never dream of voting for, let alone joining, any kind of Tory party, but Labour won't be far behind either. It would not surprise me at all if major social media initiatives were announced at both the Labour or Tory conferences. Like it or not, these cultural changes are inevitable, and a small party like UKIP with limited financial and personnel resources simply can not afford to lose "first mover" advantage in radically reorienting the structure and culture of the party on social media lines. Nothing is as dangerous as success, as the saying goes. It is far too easy to be complacent given our recent increases in membership to sit back and regard all as fine and dandy. Instead of congratulating ourselves on having 30,000+ members, we should be asking ourselves why we don't have the 4,000,000+ that some voluntary organisations like the National Trust have. Once upon time those sorts of membership figures were common for political parties, there is no reason why they can't be again given the right cultural changes. But will UKIP be among them? It has often been the fate of new political parties in Britain to have a brief "shooting star" moment; to burn so very brightly in the sky before just as quickly dimming and going out. Few now remember the old SDP, even though it had stratospheric poll ratings during some periods in the 1980s. Likewise the Green's had their moments in the sun, but are in decline now. Somehow the hoary old ugly sisters, Tory and Labour, manage to adapt and survive when they look ready for the chop. Be in no doubt, there is nothing to stop UKIP from sharing the fate of so many upstart movements that have gone before it. Despite the huge opportunities we have at our disposal, with weakened and dangerously exposed political rivals, we are a very long way away from sealing the deal. And that deal can only be sealed using the tools of social media already so predominant in virtually all other areas of modern society. UKIP had three great results in three hard-fought by-elections yesterday. Star Etheridge came a strong second in the Coseley by-election for a seat on Labour-dominated Dudley MBC. This by-election was a two horse race between UKIP and Labour with UKIP putting in an extraordinary amount of effort which was sadly not enough to overcome the tribal Labour vote. The vote splitter Tories were a distant third with the BNP worryingly in a strong fourth place, followed by the Green Party in fifth and the National Front in sixth and last place where they belong. Mike Bull saw off a strong challenge by the Tories to win the Seasalter by-election for Canterbury City Council. The Tories came second followed by Labour in third, Lib Dems in fourth (get used to it guys, it's not going to get any better) and the loony Greens fifth and last. Ruth Duffin came a very good second in the Four Marks & Mestead by-election for East Hampshire District Council behind the Conservative candidate. The Labour candidate came third whilst the Green candidate once again came fourth and last. 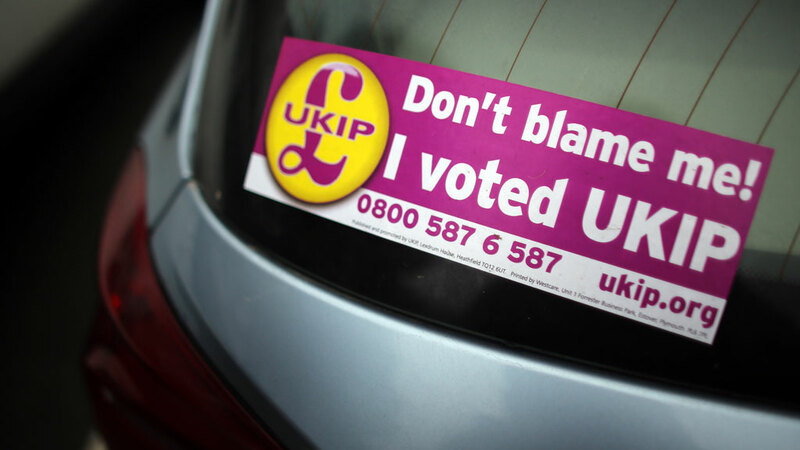 Statistical Analysis: What Will Be The UKIP Effect At The 2015 General Election? As the General Election approaches, we will start to be inundated with endless polls and predictions at an ever greater rate of frenzy. So what will be "The UKIP Effect" in 2015? Even today, almost all coverage repeats that tired old canard that a high UKIP vote damages the Tories. Lord Ashcroft was at it again recently, followed by the dependable UKIP-trashing article in the increasingly risible Daily Torygraph. This time it was the ever more erratic Peter Oborne's turn to parrot 'A vote for UKIP is a vote for Labour'. We in UKIP of course know that the truth has been far more complicated than that for some considerable time, with a rising proportion of voters from other parties switching to us. Also, very significantly, many people who have not voted at all for a considerable time are now voting UKIP. The best model so far come up with is the one by Survation which shows that the composition of UKIP votes changes with the size of UKIP's vote. At low levels, UKIP's vote is indeed heavily Tory dominated, but becomes steadily less so with time. Survation calculate that the optimum UKIP vote for the Labour Party is a UKIP vote is around 16% - a figure which is bang in the middle of the unprompted (c.12%) and prompted (c. 18%) totals for UKIP. 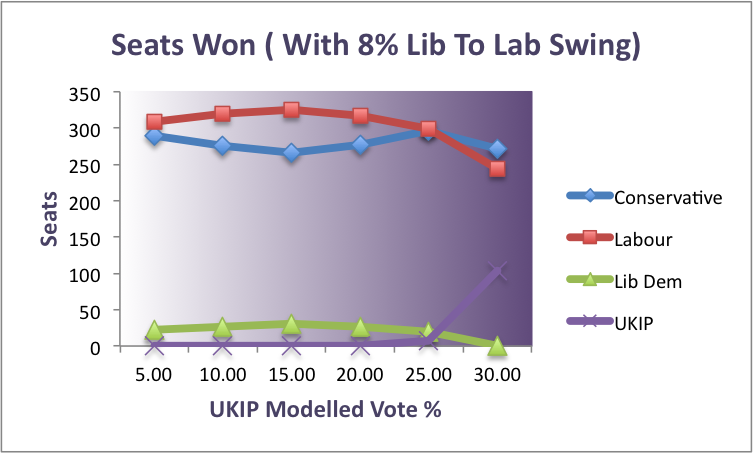 To see how UKIP may do in the next general election, I have used Survation's analysis and applied it to the 2010 General Election data*, where UKIP got 3.09% of the vote. I have then weighted that data to take into account some likely changes in voter behaviour. It is often claimed by the 'Vote UKIP - get Labour' crowd that UKIP robbed the Tories of a majority at the last election on the crude assumption that the UKIP vote was greater in many seats than the shortfall in Tory votes. 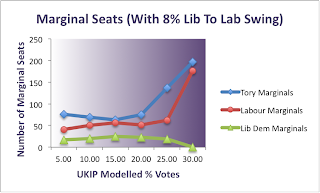 Using the more sophisticated Survation model on the 2010 election data, this is shown to be false, with UKIP denying the Tories in just 8 seats, leaving them still way short of a majority on 314 seats in total. 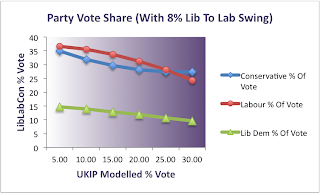 However, the Survation model does not take into account those who vote UKIP but otherwise would not have voted at all. Taking this into account would reduce the total number of seats affected still further. What we are most interested in of course is the effect of UKIP on the 2015 General Election. 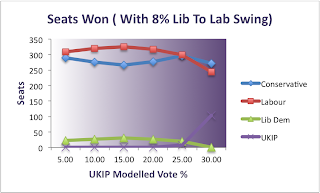 A simple model would just be to just using the Survation linear regressions to re-calculate the votes cast in every constituency for given degrees of swing to UKIP. However clearly circumstances have changed since then. The final Tory / Labour or Tory / Lib Dem swing is impossible to predict, so I don't attempt to model it here. However, one fairly certain difference is that a substantial quantity of voters who voted Liberal Democrat in 2010 have permanently switched to Labour in disgust over the Lib Dem's coalition with the Tories or their broken pledge over tuition fees. To model this effect, I have reallocated votes in every constituency based on a national aggregate swing of 8% from Lib Dem to Labour. Another major factor that must be taken into account is the effect of an MP's incumbency. An individual MP regardless of party can build up a significant personal following. Traditionally incumbency has been a weak factor in UK politics but all that changed with the advent of Liberal Democrat "pavement politics". Whereas Labour and Tory MPs have low incumbency votes of around 2% and 1% respectively, the Liberal Democrats have a whopping 5-15%, making them much harder to dislodge. One Liberal Democrat spokesman described his party as currently 'hanging on like cockroaches'. How very apt. Nonetheless, it is likely that the Lib Dem "cockroach effect" was a more significant factor than UKIP on David Cameron's failure to gain a majority on 2010. In order to model this effect, I have simply added an incumbency weighting to each party where they have a sitting MP. After taking into account the 8% Liberal to Labour swing, Labour starts off with a small advantage over the Conservative Party in terms of total votes cast. Because at low UKIP voting percentages the Tories are disproportionately affected more than Labour, the Tory vote falls more than the Labour one until, as suggested by Survation, UKIP's total vote reaches 16%. Thereafter, Labour's vote falls more rapidly than the Tories until at around 28% Labour lose more votes to UKIP than the Tories do. Moreover, at around this level UKIP severely threatens to overtake both parties in terms of the total size of the vote. As shown in the graph above, UKIP have a much more powerful effect on the number of seats won by the Conservative and Labour parties than in the proportion of votes cast: at moderate UKIP voting strengths, the gaps between the Tory and Labour parties opens appreciably. This modelling seems to tally with Lord Ashcroft's recent conclusions after his extensive polling in Tory marginals, which shows that UKIP has a strong negative effect on Tory chances at current polling levels of support. UKIP fail to gain any seats at all until their vote reaches the mid twenties, and thereafter the number of UKIP seats rises very substantially. 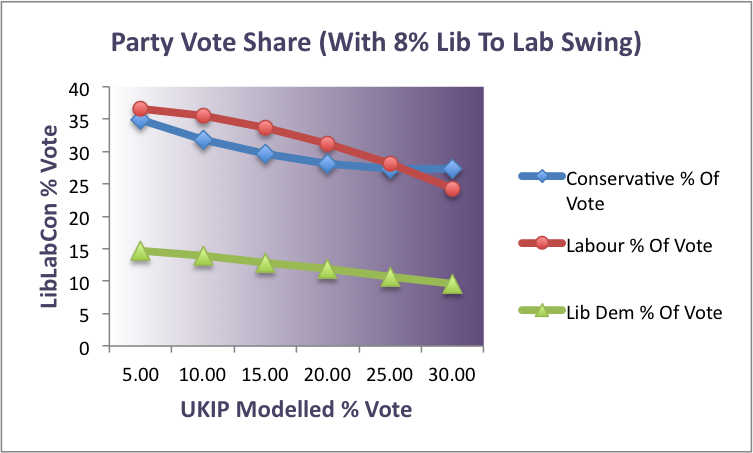 This shows the huge effect the constituency model has on favouring parties that concentrate their support effectively. Even though the percentages of votes recorded by UKIP's approach those of the Conservative or Labour parties, UKIP only wins 2 seats at 25% of the total vote! This model is very naive in the sense that it completely ignores any developing "hotspots" in UKIP support, but nonetheless it shows just how far the party has to go in building up based on local strength to create the clusters of support necessary to gain seats. Note also that the extreme incumbency effect means that the Lib Dems, despite having a maximum of 15% of the total vote, retain nearly 30 seats until UKIP support gets to very high values. No wonder Nick Clegg was looking smug at the Lib Dems' conference this week. However much we may wish it, a Liberal Democrat meltdown is very unlikely to happen. For the purpose of this modelling, a "marginal" seat is regarded as any seat where the gap between an incumbent MP and his nearest rival is less than 10% of the total vote. 10% swings at elections are rare, so a MP would normally be considered safe above that figure. As shown in the graph above, a major problem for the Tory Party is that, as it's support is more thinly spread across the country, it has many more marginal seats to defend. 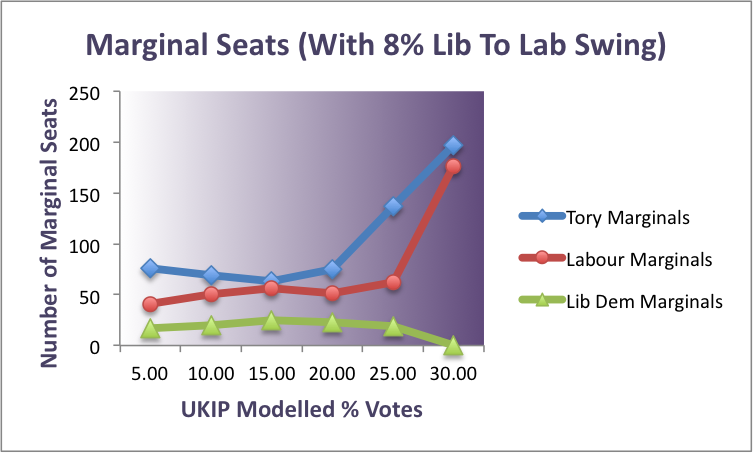 We can see by comparing the above graph with the one modelling seat distribution that, on UKIP votes up to 15%, the Tories have more marginals to defend than Labour, even though Labour has appreciably more seats. That is a very serious matter now that Tory membership is substantially below the Labour party's, significantly affecting the ability of the party to mount an effective ground campaign in swing constituencies. We can therefore see that the Tory Party really now has no choice but to radically reform itself, almost certainly along the lines that Douglas Carswell has previously suggested. As I have previously argued, this is a major threat to UKIP that we absolutely have to counter. The differential between Tory and Labour marginals decreases as the UKIP vote rises, largely because many Tory marginals become Labour-held marginals. The effect goes into the reverse above 16% as UKIP starts to take more votes from the Labour Party than the Tories for each extra percent gained. This means that Labour marginals start to become Tory again. However, above 20%, the number of Tory marginals increases dramatically as UKIP start to directly threaten Tory seats rather than just to hand them to Labour. Similarly Labour marginals start to rocket after 25% after UKIP starts to directly threaten them. This is very significant for the culture of our politics, because the collapse of the safe seat significantly weakens the incentive for Political Class careerists to enter politics, as it makes their career progression a great deal more risky. The major effect UKIP has on Lost Deposits is undeniably on it's own. 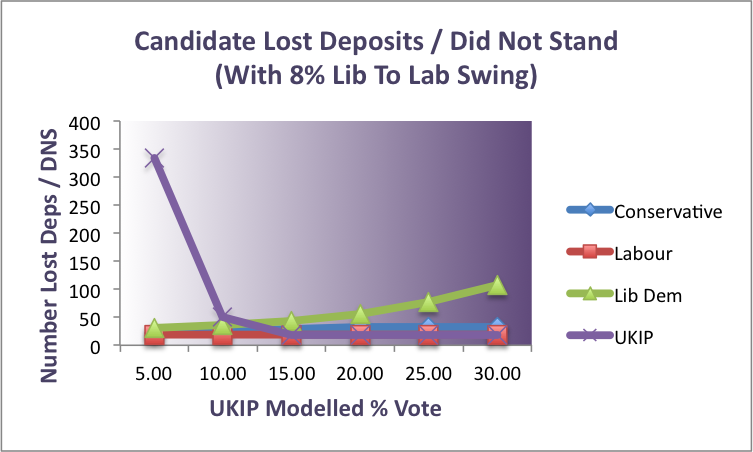 The number of lost deposits recorded against UKIP falls dramatically between 5 and 10%, which is not surprising given that the limit of a lost deposit is 5% of the vote and this model assumes a very even distribution of UKIP support around the country. The growth of the UKIP vote does not substantially effect the lost deposits recorded by other parties apart from the Liberal Democrats, who suffer the major humiliation of being effectively wiped out in substantial numbers of constituencies at high UKIP voting strengths. The commentator Fraser Nelson remarked in 2012 that we were no living in 'Tricolour Britain', where parties had a limited national presence: the Tories concentrated in the South, Labour in Northern England, Wales and Scotland, and the Liberal Democrats mostly in the South West. His thesis was that no one party could be truly regarded as 'national'. That has certainly been true of the Tory Party for some time, which has become all but extinct in Scotland and Wales and is essentially now an English Party. The rise of UKIP is exacerbating these trends. 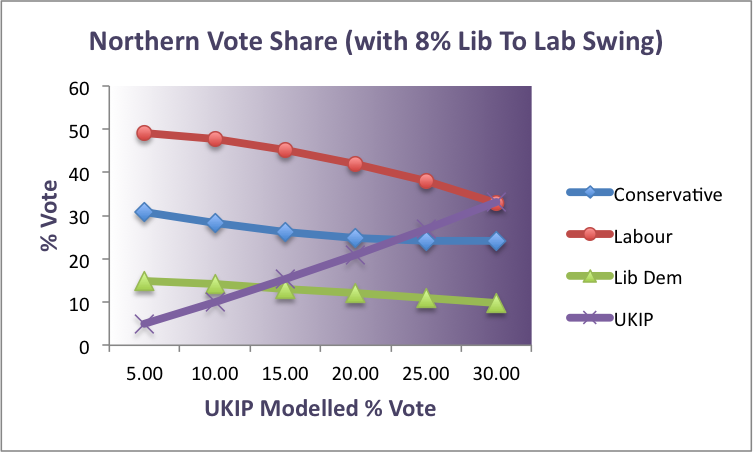 The models above show that, amazingly, UKIP becomes the second party in the North at around 23% of the national vote. 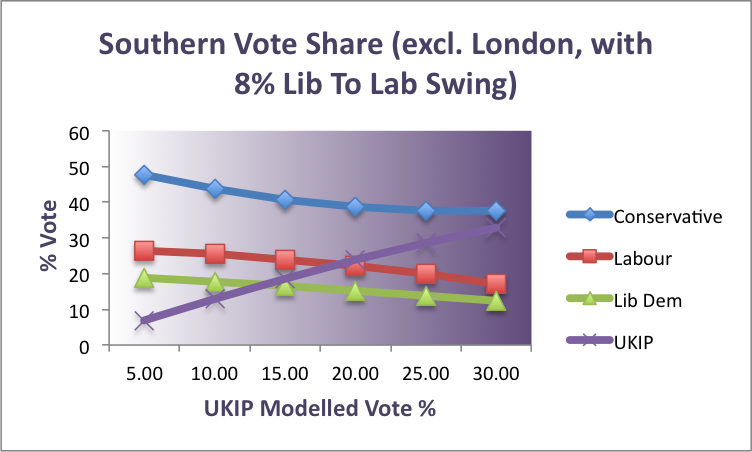 In the South (excluding London), UKIP overtakes Labour on just 20% of the national vote. Conclusions: Is your glass half empty......or half full? How you interpret these results depends very much if you are pessimist, or an optimist. A pessimist would say, with some justification, that however well UKIP poll now, there is bound to be some migration back to the LibLabCon parties come general election time. Therefore the best UKIP could possibly hope for is a vote in perhaps the low teens. In other words, a vote that could well result in the very worst possible outcome from a 'Kipper point of view: a Liberal Democrat - Labour coalition which would almost certainly result in no European referendum as well as daft socialist and Metro-Lib policies being implemented. Probably worst of all some kind of new constitutional tinkering that would ensure that the ghastly Lib Dem's stayed in power in perpetuity. A future of left-wing hegemony would seem to be assured. An optimist would say that it is perfectly possible for UKIP to poll at much higher polling levels, particularly if the party has momentum after the European elections next year. Moreover, the floundering Ed Miliband and Labour's travails means that the Tories may well make up some ground against Labour, while still losing other votes to UKIP. Campaigning on the white hot issue of immigration is likely to swing many Labour - leaning working class voters to our cause. 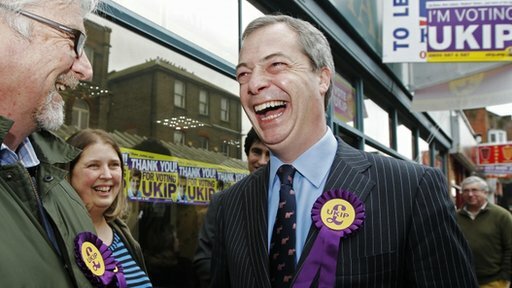 If UKIP score 20% or above, then British politics really will be shaken to it's foundations: the vast growth in marginal seats will throttle the career path of the political class and at the very least will mean politicians will have to start listening to the people rather than residing in a Metropolitan Liberal echo chamber. Secondly, the inability of any wing of the LibLabCon to claim a truly national mandate will surely lead to a much greater clamour for localism and devolution of powers away from Westminster. Moreover, it is entirely possible if UKIP can create some regional hotspots, East Anglia being the most likely area, that we will finally get seats in Parliament. Is it too outlandish to think that UKIP could hold the balance of power? Probably, but we may as well shoot for the stars. Please note that the modelling undertaken here is entirely the private work of the author. It is not endorsed in any way by UKIP, Survation or any other organisation. For the budding data scientists and number crunchers amongst you, here are a few notes on the modelling approach taken. Survation very helpfully supply three simple linear regression lines for each of the LibLabCon parties which makes modelling easy. Where X = the total UKIP vote. The Survation model is not without it's weaknesses: firstly, it seems to take no account of voters who have previously not voted at all who now vote UKIP. Including these people would tend to flatten modelled changes between the LibLabCon parties as for a given UKIP total vote there would be less proportional swing from one branch of the LibLabCon to another. 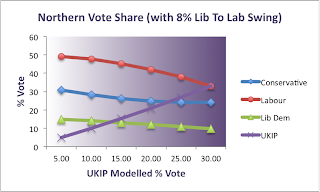 Secondly, Survation's linear regression model is not really applicable after a UKIP total vote of 25-30% is reached, because the negative slope of the regression line for Tory switchers to UKIP means that after around 30% the model goes into reverse, with the total number of Tory voters starting to rise with further increases in the UKIP vote! However, Survation can obviously be forgiven that as 25-30% is beyond the upper limits of any currently attained or projected UKIP aggregate vote. Note: when modelling swing, you should not simply use the linear regressions on the total aggregate vote for each party, work out the proportion switching to UKIP, then divide that total to get the number of switchers in each constituency. Instead, you must work out the number of voters switching from each party based on the proportions of Conservative, Labour and Lib Dem voters in each constituency compared to the national average votes for those parties. As noted above, an 8% swing can not be calculated by simply mean taking 8% off the Lib Dem total in any given constituency and adding it to the Labour total. Rather, the swing must be proportional to the number of Liberal Democrat voters in any given constituency against the national average of such voters. Incumbency is extremely difficult to model well because it will vary wildly depending on many factors. The approach adopted here is crude but does given some indication of how much better Liberal Democrats candidates in particular will perform than modelling based on average swings would suggest. I have added incumbency weightings for all Conservative, Labour and Liberal Democrat parties. These weightings are 1, 2 and 10% for the Conservative, Labour and Liberal Democrat parties respectively. In order not to distort aggregate vote totals, I have then subtracted the proportional amounts from parties where they are challengers to a seat. For instance, the Lib Dems held 57 out of 650 seats in the 2010 General Election. I have therefore added 10% to the calculated votes of Lib Dem incumbent candidates. I have then subtracted (57 / (650 - 57) ) x 10 = 0.961% from all other Lib Dem candidates to even up the aggregate vote. Note that the lost deposit totals also include seats where parties did not stand, which give a baseline figure of around 19 "lost deposit" seats for the LibLabCon parties who do not as a rule stand in Ulster. "Northern" vote share is comprised of those constituencies in the North West, North East or Yorkshire and Humber. 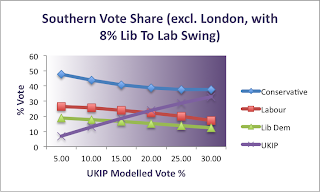 "Southern" vote share is comprised on constituencies in the South East, South West and Eastern (East Anglian) regions. London is excluded. A Conservative student blogger and Member of the UK Youth Parliament by the name of Tom Pike has written on the obscure Conservative Companion website that UKIP "wish simply to bully [the Tories] into a pact" and that the Tories shouldn't just shoot the UKIP fox, but "damn well skin it". Although it would be amusing in a sadistic kind of way to take apart his article line by line as I have done with others, it would also be time consuming and at 11:45pm on a school night I'm not going to satisfy my inner sadist. Instead I will leave you with the comment that I left on the article which he has thus far declined to approve despite in moderation for nearly 2 days. Your youthfulness comes across in your writing which, whilst articulate, is just a string of stereotypical nonsense and fanciful musings. UKIP doesn’t want to bully the Tories into a pact – we want to beat you, we want to beat Labour and we want to form a government. Throughout your article you refer to the fact that UKIP’s policies are simply better and more popular than Tory policies but rather than come to the obvious conclusion that the Tories should stop trying to change the way people think and adopt some policies that people actually want, you think that the Tories should instead go on the attack and tell voters that UKIP policies are full of holes. We’ve had decades of alternating Tory and Labour governments and they’ve done nothing for us. Cameron’s “promise” of an EU referendum on 2 years of negotiations he’ll conduct on our membership if he wins the next election (he won’t) which would then result in another 2 years of negotiations after invoking Article 50 of the Lisbon Treaty when we vote to leave is worth as much as his cast iron guarantee of a referendum on the Lisbon Treaty which we never had. Cameron is a dishonest europhile who has surrounded himself with other dishonest europhiles and nobody trusts them. That is why you will lose the next election – not because Ed Milibland or Labour are better (they’re no better or worse than the Cameron and the Tories) but because nobody trusts the Tories. I would leave UKIP rather than form a coalition with the Tories and so would a great many UKIPpers. The Lib Dems happily destroyed themselves for a term in government because that is the limit of their ambition – to hang on someone else’s coat tails. Of course, it helps that David Cameron is more of a convictionless Lib Dem than a Tory but the two are really chalk and cheese on so many issues as far as the membership of those parties are concerned. It was never going to work but all the LibLabCon are interested in is the accumulation of power and wealth. 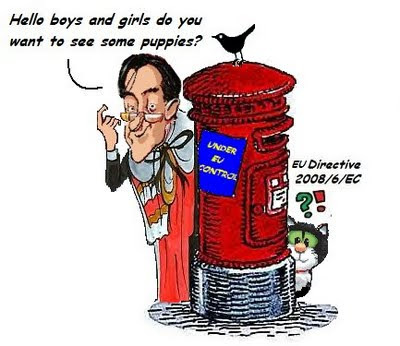 UKIP may not have all the answers but we’ll happily admit it when we don’t. We don’t have access to the government computer systems the LibLabCon have to model their economic and policy changes but we have real experts advising on policy – people who’ve had real jobs and made their own success. We don’t have decades (or centuries) of being in government to give the illusion of competence but we have real people saying real things about real problems. That is why we will give all three of the old parties the biggest kicking they’ve ever had next year in the EU elections and in 2015 in the general election. If you lose it’ll be your own fault and it’s time the Tories grew up and took responsibility for their own actions. UKIP is fighting hard to win a by-election in Coseley on Thursday for a seat on Dudley Metropolitan Borough Council. People have been travelling from all over the country to help UKIP's disability spokeswoman, Star Etheridge, fight her campaign. She has had supporters from as far as Scotland and Cornwall coming to the West Midlands to deliver leaflets. 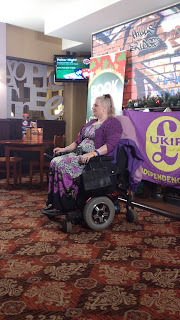 Star was well received when she spoke at a public meeting last night in the Apple Tree pub in Coseley along with UKIP press officer, Gawain Towler. A couple of ladies who had just gone in for a drink ended up joining in the question and answer section and said they would be voting for UKIP in future.